I am a BIG FAN of no messaging options. Can you elaborate? Not that I doubt you, it would just be interesting to know. I notice that Instagram didn't intro private messaging for more than 3 years after they launched. Not to come off as a curmudgeon, but what I like about CAKE is that it's Mission Statement is about discussion. I am not a huge cocktail party guy, but, the best parties I have gone to is where I can strike up random, interesting conversations with strangers about a wide variety of topics. At the end of the conversation there would be a mutual respect of shared or not shared ideals and mostly not even a handshake. On to the next conversation. Social media is such a broad landscape where EVERYONE seems to anchor everything in "friendship". I am not looking for any more "friends"; in fact, the older I get, I try and spend my precious time with fewer friends. Not necessarily clones of myself but people I either respect, like or both. I believe that by NOT having a PM feature, it sort of compells people to basically put their best foot forward and also it disallows any backroom politicking. i.e. "hey George...did you see what Chris implemented on CAKE? WTH was he thinking?" In web terms WYSIWYG. If at some point you are compelled to add a PM feature, that will not make me pick up my back of toys and leave, but, I just appreciate this is the only "forum" I have ever been a part of that does not have that feature. AND, I LIKE THAT. In any other forums I turn off all PM features as applicable. ADV is the ONLY forum I allow PM's. There are some crazy cats on ADV, but, something so unique about that culture that having a PM option was important. I am not a huge cocktail party guy, but, the best parties I have gone to is where I can strike up random, interesting conversations with strangers about a wide variety of topics. There is a social dynamic I’ve noticed where the longer you know someone the narrower your conversation range becomes. It often takes a stranger into a group of regulars for the conversation to broaden. The back channel in forums can create a toxic environment that inhibits new conversations. It also creates another layer of moderation required to deal with harrassment. If I want to talk privately with someone, I can tell them to DM me on Twitter. There is a risk to Cake that I will then spend an hour reading tweets instead of immediately returning to Cake. It’s an interesting optimization problem over the value of private messaging. If I want to host a panel on “How to make Maths fun,” I can DM invites to the mathematicians I know on Twitter, but how do I ask a mechanical engineer or a geophysicist on Cake if they’d like to join the panel? Seriously, is there a protocol for doing this? I can see advantages if there was a method on Cake for privately requesting panelists as well as privately receiving their yes or no responses. If I understand you correctly, I think panels already work this way? When you start a panel, you can invite anyone you want to join the panel. If you enter an email address instead of the username of a Cake user, we'll send an email invitation to that person. If they're not already on Cake, they can sign up. 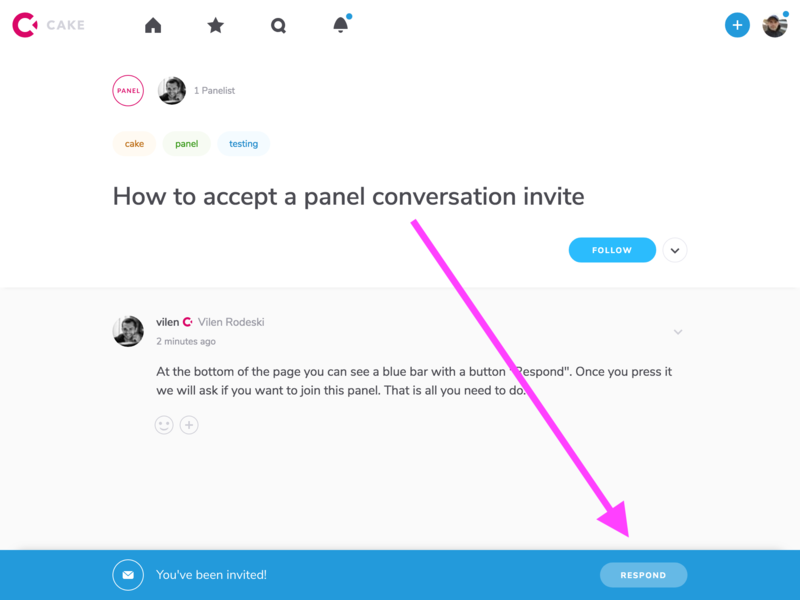 Everyone invited to participate in a panel has the opportunity to either accept or decline the invitation. People who accept become visible to everyone as a panelist. Only the creator of the panel can see who declined. Okay, that’s awesome to know. Thank you for the clarification. I wanted to ask first and avoid messing things up.